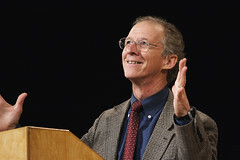 At a seminar two weeks ago, John Piper gave a message entitled, Adoption: The Heart of the Gospel. Adoption was for God, and is for us, costly (Gal. 4:4-5; Gal. 3:13). Adoption did for God, and does for us, involve the legal status of the child (Gal. 4:4-6). Adoption was blessed, and is blessed, with God’s pouring out a spirit of sonship (Gal. 4:6). Adoption was for God, and is for us, marked by moral transformation through the Spirit (Rom. 8:14). Adoption brought us, and brings our children, the rights of being heirs of the father (Gal. 4:4-6; Rom. 8:16-17; 1 Cor. 3:21-23). Adoption was for God, and is for us, seriously planned (Eph. 1:4-6). Adoption was for God, and often is for us, from very bad situations (Eph. 2:3). Adoption meant for all Christians, and means for parents, that we suffer now, and experience the glory later(Rom. 8:22-23). You can either read the transcript or listen to the audio — note that the transcript is ususally condensed.